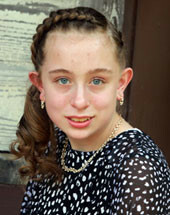 Hailey, born June 2001, is a loving child who tends to keep to herself. She can be shy and quiet when meeting new people. This young lady is doing well in school. Hailey enjoys learning and is capable of communicating her feelings. She enjoys reading, arts and crafts, shopping, and eating out. Hailey loves music, singing, and dancing. She also enjoys video games, and her favorite food is lasagna. It is felt that she would thrive best in a two parent home. Hailey deserves a loving, supportive forever home with a family who will help guide her, through the sometimes difficult teenage years, so she will turn out to be the very best young lady she can be.